The diabetes that is endemic in Micronesia is a legacy of modern store-bought foods and a less strenuous lifestyle than South Pacific islanders enjoyed prior to the encroachment of western culture. Detecting and treating the disease in Micronesia is complicated by the fact that electrical power and cell phone coverage is erratic or nonexistent in many of the remote villages and outer islands. Moreover, many of the inhabitants are distrustful of western medicine, and reluctant to travel to clinics or hospitals for help. To address this problem, four biomedical engineering students are working with Timothy Dye, a professor of obstetrics and gynecology at the Medical Center, on a portable diabetes screening device that could be carried by health workers into remote areas. This would make it easier to identify, on the spot, villagers at high risk of the disease. Dye’s research team is eager to test such a device on Pohnpei Island. 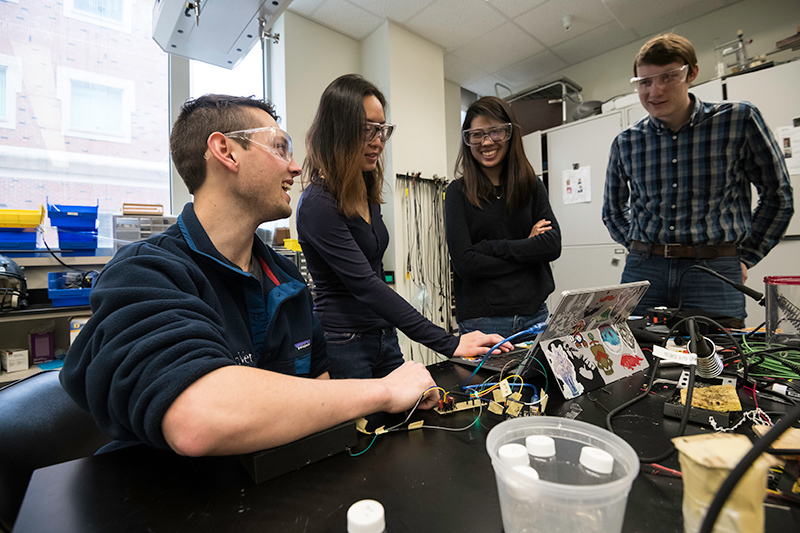 “This would help start the educational process with people who are kind of scared of western medicine and who think hospitals are where you go to die,” says Matt Boulanger ’18, who is part of a senior design team that also includes Jack Hayden ’18, Fredella Lee ’18, and Sue Zhang ’18. “By having this done and seeing the results in a point-of-care setting surrounded by their own homes, they might be more receptive and comfortable,” says Lee. Most diabetes diagnostic devices found in US clinics and doctor’s offices are not portable and require constant refrigeration because they analyze blood samples. The AGEs “auto fluoresce and emit a photon when they get hit by a photon of a certain wavelength,” Hayden explaines. The device the team came up with looks like a small black box with a rectangular opening on top where a patient’s arm is placed for the screening. Long wave ultraviolet A light is bounced off the skin to detect the amount of AGEs present. Though based on the same science as the Dutch AGE readers, the students’ device differs substantially, Zhang says. The Dutch device for example “has to be hooked up to a spectrometer, which is a very expensive, very precise device for measuring different wavelengths of light, has to be hooked up to power, and is not very portable,” she says. The team “toned down” the detectors and provided a built-in energy source to make their device easily portable. “Also, there were a number of things we came up with in order for this to work in the Pacific islands, including moisture barriers,” she says. 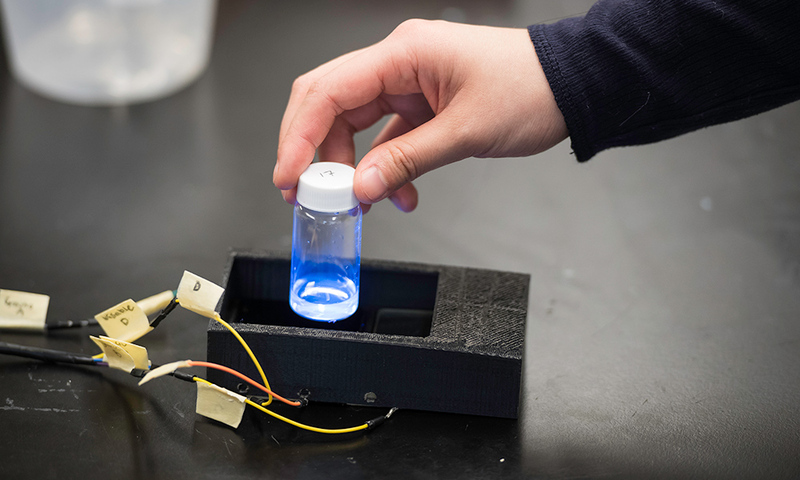 The students learned about electronic circuits in prior biomedical engineering classes, and got additional help for this project from Scott Seidman, associate professor of biomedical engineering, who helps oversee the department’s senior design projects. But the field of optics was new for the students. They found plenty of help. Edward Brown, an associate professor of biomedical engineering whose lab uses multiphoton laser-scanning microscopy for the study of biological processes in living, intact tissue, assisted the students with “finessing the optical pathways.” Andrew Berger, associate professor of optics, and Per Adamson, an instructor and director and coordinator of teaching labs at the Institute for Optics, assisted the students in using spectrometers for testing. Though the device still needs some fine tuning, Dye and his colleagues were impressed when they met recently with the team, Seidman, and Brown to review progress. “This is exactly what we want — something that’s portable, easy to use, and can help us provide some actual clinical information in the field and is not just estimating risk based on weight and symptoms,” says Dye.